What is Considered a True Natural Green Diamond? In the rough state, there are three different types of green diamonds. These include a crystal shaped stone with a shade of green similar to that in a swimming pool, a stone with a dark green outer layer, and a stone with a smooth yellowish-green color. The first two types of stones typically lose their green hue after being cut and polished. Only the third type of green diamond is sold as a true fancy colored diamond. How do Green Diamonds Get Their Color? 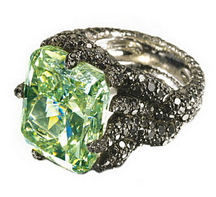 It has been suggested that green diamonds are derived from contact with radioactive materials millions of years ago. Typically after polishing and cutting, the green color is lost; however the stones that remain green after have been affected with both alpha and gamma radiation waves. Green diamonds are among the rarest fancy colored diamonds in the world, meaning there are very few green diamond sales recorded in history. For over 200 years, the Dresden Green has been on display in Dresden, Germany. Frederick Augustus II bought the diamond in 1741 at the Leipzig fair from a Dutch merchant by the name of Delles. The stone originated in India where it was cut in Ahmedabad which at the time was the most famous diamond cutting center in the country. 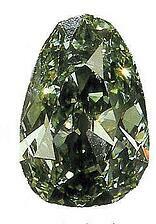 To date, the Dresden Green is the largest natural green diamond found, weighing 40.70 carats in its pear-shaped cut. The Gemological Institute of America (GIA) has rated this beautiful diamond a near perfect clarity grade. With minor recuts, the Dresden Green has the potential to be rated internally flawless. One of the extraordinary features of the Dresden Diamond is that unlike most other colored diamonds, the green color is equally spread throughout the stone. 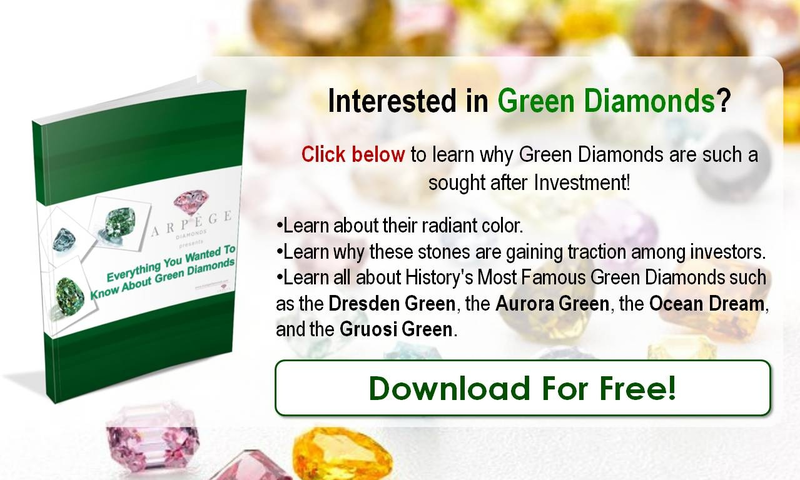 Not only that, the Dresden Green is chemically pure, meaning the stone has no traces of boron, hydrogen, or nitrogen which is commonly observed in many colored diamonds. What was the Highest Green Diamond Price Ever Paid? Natural green diamonds have made few appearances at auctions, but their value has been steadily increasing throughout the years. In 2009, a 2.54-carat fancy vivid green VS1 diamond sold at Sotheby’s Geneva Magnificent Jewels auction for a record price of $3.08 million. 7 Years later, in May of 2016, the Ocean Dream diamond broke that record as it fetched a very impressive $8.6 million. The rein of this diamond however, was short lived. During the same month of the same year the Aurora Green went on the block at Christie’s Magnificent Jewels Hong Kong auction. This 5.03 carat, rectangular cut, VS2 clarity, Fancy Vivid Green diamond ultimately sold for $16.8 million, or an astounding $3.3 million per carat, becoming the most expensive green diamond to ever be sold at a public auction to date. Can Green Diamonds Have Secondary Colors? Yes. Green diamonds have been known to have gray, brown, yellow, and blue as secondary hues. Jewelers have been known to artificially create blue-green stones, since its extremely rare to find a naturally occurring one. However, true fancy blue - green diamonds do exist. 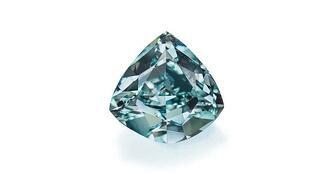 A well-known blue green diamond is the Ocean Dream Diamond. This magnificent stone boasts a unique deep bluish-green color, evocative of the ocean. The diamond originated in Central Africa and weighs 5.51 carats. Most recently, the Ocean Dream was showcased at the Smithsonian’s “Splendor of Diamonds” exhibit along with many other rare gems. If Cut and Polished, Do Green Diamonds Retain Their Color? In most cases, because natural green diamonds need to have come into contact with something that is radioactive, their hue is mainly found on the outer layers of the stone. This means that, the more a green diamond's size is reduced, the more it will potentially loose is color vibrancy and homogeneity. 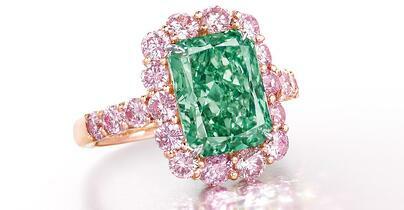 There are however green diamonds that despite being considerably reduced in size, still retained their radiant color. One such example is the Gruosi Green diamond. Fawaz Gruosi is one of the most famous and illustrious jewel collectors in the world. He is the owner of Swiss jewelry company, de Grisogono. In 1998, Gruosi purchased a green diamond that originated from South Africa. The stone weighed almost 100 carats, but after much cutting and polishing, the Gruosi Green Diamond ended up weighing only 25 carats. Just like the Dresden Green, this stone was affected with radiation millions of years ago, making the green color uniformly spread throughout. Green diamonds are one of the most rare stones in the world. With its geological features, it really is a ‘needle in a haystack’. Green diamonds are the only stones that are chemically free and have aged over millions of years. Its discovery in the past 300 years is just a moment in the diamonds’ lifetime. Gruosi himself, which the Gruosi Green Diamond is named after, believes that he many never want to part with his own green diamond as it is like a rare piece of art that may never repeat again. Want to stay on top of colored diamond news? Connect with us on Facebook and Twitter!